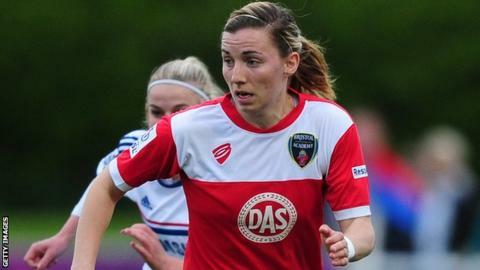 Bristol Academy defender Grace McCatty has agreed a new deal to remain with the Women's Super League club for the 2015 season. The Gloucester-born 25-year-old has been a Vixens players for nine years. She played 19 games for the club last year and helped them reach the Champions League quarter-finals for the first time in their history. After her contract ends in the summer, McCatty intends to take a break from football to volunteer in Zambia. "I will obviously miss football whilst I am away but this is an opportunity I had to take and I would like to thank the club for their understanding and support in allowing me to take up this position," she said. "My plan is to take a break later this year before returning to Bristol in time for the 2016 WSL season."